Beautiful weather for December brought a crowd of onlookers out to the Dickens in Dundee Parade today. 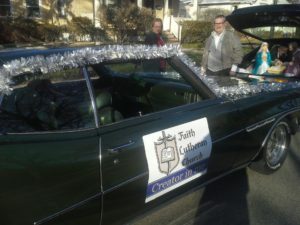 We had two entries from Faith and passed out a lot of candy canes and fliers. May Jesus bless the children with hungry hearts for the gifts He gives to all who believe. “Create in me a pure heart, O God” Psalm 51:10 NIV.